Become part of the world’s biggest teaching community by posting on the forums. You can get together with teachers from around the globe who can offer you classroom support, healthy debate and extra-curricular fun. Browse the topics on the Tes Community homepage and find out how easy it is to become a forum member. How do I find my favourite forums? Within the main forums sit the sub-forums which contain threads about the main topics. Whatever question you have - whether it’s about a workplace dilemma; a query about the subject you teach; what it’s like to work in your sector; or how easy it is to start flexible working - there is a forum to cover your needs. 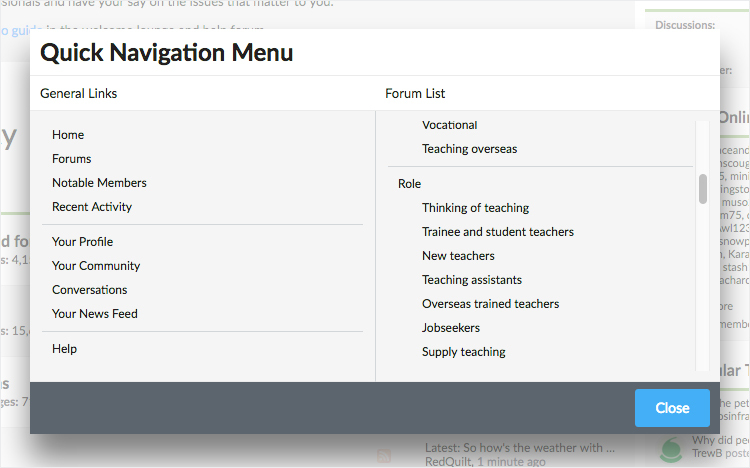 1) To start a new forum topic you will need to find the relevant parent forum. Scroll down the forum list on the Tes Community homepage to find the forum that is relevant to the topic you wish to discuss, and then select the forum you need by clicking the sub-forum title. 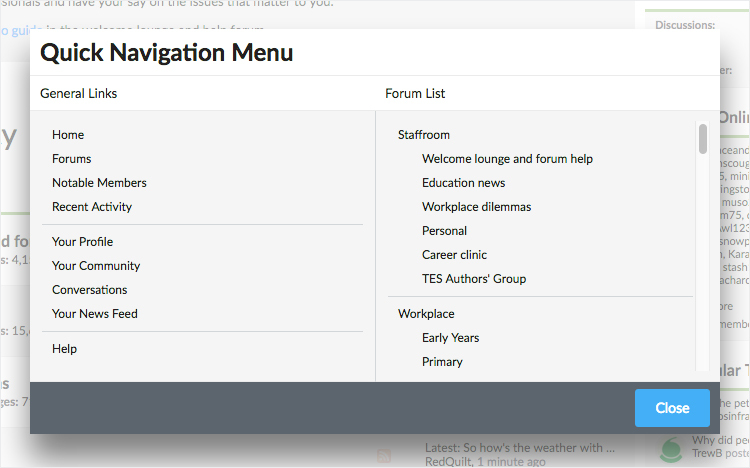 In the quick navigation menu box you will see two sections: General Links (including links to pages showing notable forum members, new posts under the recent activity stream and the help section) and Forum List. Under the Forum List you will see the seven main forums with the sub-forums listed underneath each section. You need to click the scrolling bar, on the right hand-side, and move it down the list until you see the forum you want. Move the cursor to the name of the forum. Each forum name is a clickable link so when you move the cursor over each title it will appear underlined. 2) The landing page of the sub-forum will appear. You will see a blue button with “Post New Thread” opposite the name of the sub-forum. Click on the “Post New Thread” button to start a new topic. 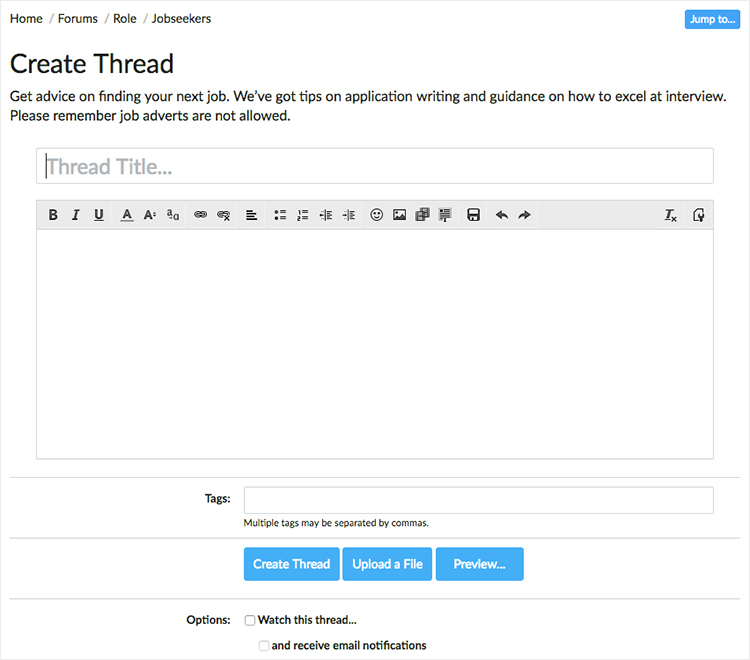 3) A new page will appear where you can fill out the details to create a new thread on your topic. Give your message a title in the box headed “Thread title…”. The following box, with the formatting tool bar at the top, is where you can type in the body of your message. Here you can choose various formatting options such as highlighting text in bold or italic, and you also add bullet points, images, links and videos to your messages. 4) In the box marked “Tags”, you can add keywords to help other forum members find your messages. Separate your keywords with commas. 5) You can preview your post before it goes live to check that you are happy with it. To make your post live, click on the blue “Create Thread” button. The new thread will appear near the top of the forum landing page. When you click on this button, the text of the comment that you are responding to will appear in the comment box at the bottom of the thread. You will need to scroll to the bottom of the box to add your own message. When you have finished typing your message, you need to click on the blue "Post Reply" button. You can also type your message directly into the comment box at the bottom of the thread that you wish to respond to. When you have finished, click the "Post Reply" button. You can keep track of the discussions you have participated in by watching threads. At the top of each thread on the right-hand side you will see a clickable link tab called "Watch Thread", which is highlighted in blue. Click on this link; a pop-up box should appear with the name of the thread as well as two options for you to view the discussion. The first option allows you to receive email notifications every time a new post is submitted and the second option allows you to watch the thread without receiving email notifications. There is also a tab at the top right-hand corner of the screen, below the top navigation bar, called "Watched Threads". Here you will find a list of the 20 most recently updated threads with unread replies that you are watching. You can see all your activity on the forums by visiting your public profile page. You need to scroll to the bottom of your personal profile where you should see a blue button marked "View your activity" under the Community section. You can send messages to other members of the Tes Community by using the private conversation function. You can either go to the drop-down menu by clicking on your username on the far right-hand side of the top navigation bar and then clicking on the "Conversations" link, or you can click on the avatar of the forum member you wish to contact. A preview profile pop-up box will appear with the option to "Start a conversation". More information about starting a conversation can be found here. How can I contact a Community member about a specific question I have asked on the forums? You can alert a member to a comment, question or response you have made in a thread by using the tagging alert system. You will need to tag the forum member in the comment. All you have to do is use the @ sign followed by the username, for example: @Tes_Community. A pop-up box will appear with the username or similar ones as you are typing out the username. If the correct username appears, you can select the one you need and the rest of the name will automatically appear in the comment box. When you submit the post, an alert will be sent to the person you have tagged. The alert will appear in the drop-down menu under your name on the right-hand side of the top navigation bar. Does the Tes Community have any guidelines on posting comments? Yes. Please see our house rules. Is there a "how to" guide for the Tes Community? Yes, you can find out more information about how to post and the other functions available in the forums by reading the how to guide. I'm worried about my anonymity on the forums. What can I do to protect my identity? If you are posting about sensitive issues such as bullying, stress or disciplinary matters on the forums then it is advisable to protect your identity. There are precautions you can take to preserve your anonymity. Please do not post under your real name and do not include too many details that could make you or your place of work easily identifiable. Make sure that posts are set to appear under your Tes username rather than your real name. To make sure that you have selected to display your username on the Tes Community site, you can check your Tes user profile or you can submit a test post on the forums to see what name is published. You can report the test post so that it is removed from the forums by the Moderation Team. A report button appears at the bottom of each post. If you wish to change your username, then you can send an email request to help@tes.com including your current name and the new one you would like to use on the forums. Yes, send an email request to help@tes.com from the email address registered on our site, quoting your preferred new username. Please remember that symbols or spaces are not allowed in a username. Thousands of messages are posted to the Tes Community every day. We operate a notice and take down policy known as reactive moderation. We rely on our members to notify us about messages which break our terms and conditions. If you see a comment, group, blog posting or indeed any content that worries you, please hit the ‘Report Abuse’ icon. Make sure to tell us the reason for reporting the content. Once we are notified of abuse, we will use our best endeavours to promptly remove content that is in breach of our code of conduct or our terms and conditions, but we cannot guarantee to do so. This includes comments that contain personal attacks, break the law or are obscene, racist, sexist or homophobic. Please note that any subsequent posts repeating the words in the deleted post may also be deleted. A swear filter is in place to block out offensive words. Please note: Threads or posts may be deleted and members may be banned at the sole discretion of Tes moderation staff without notice. We reserve the right to amend our moderation policy at any time without notice. You should bookmark this page and review it periodically. As well as this code of conduct, specific community areas also have additional guidelines which govern your use, so be sure to review the sticky threads in each area before posting or starting a new thread.